Predictive analytics has the power to change what organizations do and how they do it. Yet many companies are equipped with the right technology, but most lack the organizational capacity to take full advantage of predictive analytics. In addition, many organizational processes aren’t built to make use of analytics and make it a competitive advantage. 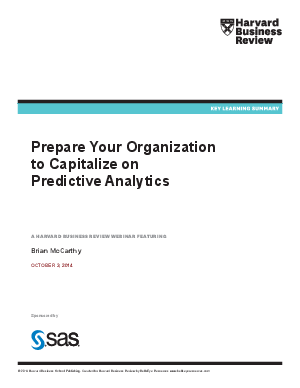 High-performing organizations leverage the power of analytics by channeling their efforts in four areas: focus, adopt, adapt, and activate. These companies have embraced a new paradigm that promotes agility, fast execution, and lasting organizational change.